The programmes provide professional development and training for school leaders, teachers and teaching assistants. Numbers Count programmes are delivered by teachers. They transform mathematics for the lowest achieving children AND raise standards for all children. They are intensive interventions for children in Years 1-8 who have the greatest difficulties with mathematics. The specially trained teacher supports other staff in school. 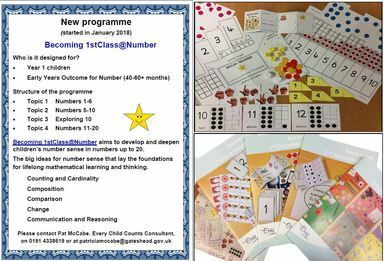 Becoming 1stClass@Number – for children who need further support to secure the Early Learning Goal for Number. Talk 4 Number programme is delivered by a teaching assistant and develops mathematical language and thinking. High quality professional development enables a teaching assistant to support pupils in Years 3 and 4 to talk fluently about their mathematics. Pat trains within Gateshead, Durham, Northumberland, Cumbria, Newcastle, South Tyneside and Sunderland areas. If you are unable to attend at the venues stated, we will consider training a cluster of schools at a venue of your choice (possibly at one of the schools in the cluster).